The charm builds! Immensely impressive Victorian mansions with inviting nostalgia and charisma boast of the architectural elegance of a by-gone era. 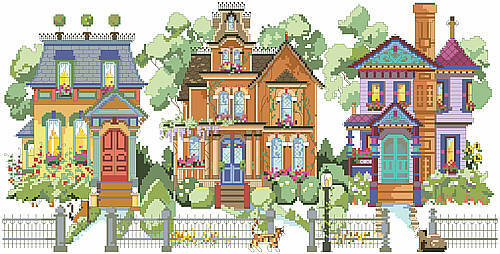 This Counted Cross-Stitch design will catch your eye as the kitty in each yard captures your fun-loving fancy. Contents: Stitch Count 252w X 127h. Finished Size on 14-ct 18" X 9"